Doncaster Knights have bolstered their back row by signing Tongan international Jack Ram from New Zealand provincial outfit Northlands. Ram, 29, arrives at Castle Park on the back of a successful autumn tour with Tonga, during which the flanker played a crucial role in the Pacific Islanders’ victories over Italy, USA and Spain. His signing is a timely boost following news that Beau Robinson has been ruled out for the season. Director of rugby Clive Griffiths said: “We are delighted to have secured Jack’s services especially following the body blow that we will be without Beau Robinson for the rest of the season. “The return of our dual-registered players to their parent clubs highlighted the need to strengthen the squad and we’re delighted to bring Jack into the club. Ram made his international debut against the USA last year. He has been a regular feature in the Tonga side ever since, starting in all three autumn victories. “I’m really looking forward to getting stuck into it here, I’ve never played rugby in England before so I’m excited to get started in the Championship,” said Ram. 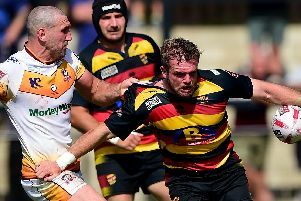 “I played a season with WillGriff John in Northlands and knew he’d come here and was enjoying it, I had seen how Doncaster went last year and how well they had done and I’m glad to be here to try and help the team do well again this season.